Is it our increasing population that is really to blame for climate change? Should we be focusing our efforts on reducing the birth rate rather than the emissions of those already alive? This is a difficult one for me, with a young family of three, but I will remain objective and see where it leads – please bring me up short if I stray. An expert in the field of forecasting long term trends, who happens to be an employee of a large oil company, suggested during a public debate that 40% of future increases in greenhouse gas emissions are expected to result from a growing population, with the other 60% from lifestyles. On those rough figures, it would seem that the answer is a bit of both. Logically, there wouldn’t be a problem if the human population was a lot lower – emissions would go down proportionally and more so with fewer people developed nations. The problem would also largely go away if everyone adopted simpler, less destructive lifestyles. A large population would still have a significant impact, though. So what should we do? I feel the need to look at a few numbers. What would happen if we went to the extreme and banned all new births? No one is suggesting we do – I’m just taking it to an extreme. I’ll concentrate on the western world, in fact the UK, as I’ve got some numbers to help me. Cautionary note – take these numbers as back of the fag packet calculations – I’m doing them to get a picture, nothing more. They ought to be in the right ball-park. According to the book “How Bad are Bananas?” by Mike Berners-Lee, the average child born now is expected to be responsible for 373 tonnes of carbon dioxide emissions in their lifetime. According to UK government projections, there are expected to be 1,100 births per 1,000 women from 2014 to 2030 [no, must have misinterpreted the ONS site – less than half that – thanks to Stewart for pointing out in comments below – other figures below have been corrected accordingly]. Over that period, there will be about 67 million people in the UK on average, so about 33.5 million women. So about 15 million births. By my rough calculations they would be responsible for about 4 billion tonnes of CO2 over their lifetimes, of which 1.3 billion tonnes will be emitted by the end of 2030. That’s of a total of 10.8 billion tonnes for which the UK is expected to be responsible over the same period. So we could reduce our total emissions by 13% if we stopped all births over that period. Of course we wouldn’t stop all births, that would be crazy. So how about reducing the birth rate so the average number of children per family was 2? It’s only slightly over 2 at the moment, so that would have very little effect. 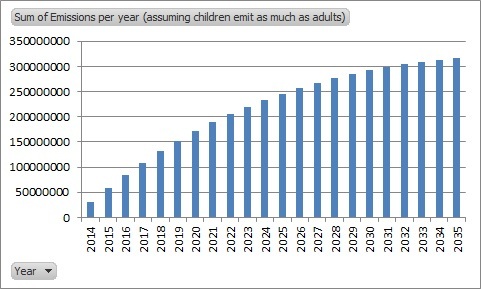 Roughly speaking, reducing the number of children to one per family would save about 7% of UK emissions. These numbers all assume that the UK will decarbonise the energy sector by 80% by 2050, according to its international agreements. They also assume that children are as responsible for as much carbon dioxide as adults. So, from a carbon emissions standpoint, it is worth trying to reduce the birth rate. But it certainly wouldn’t solve climate change. And it would reduce emissions anywhere near quickly enough. The only way to do that is to stop using as much fuel and energy now, by our lifestyle choices. This entry was posted in Final Hurrah and tagged climate change, Numbers, population by johnbelljubble. Bookmark the permalink. John, I know it’s only back-of-a-fag-packet stuff, but your estimate for the number of births is out by a factor of two-and-a-bit. That would have quite an impact on your “reduce our total emissions by 30%” conclusion. Thank you – how so? I’ll correct it. Just double-checked them against the ONS birth figure, and see that you are right – their about 2.4 times too high in my calculations. Must have mis-read the other ONS figures about the birth rate. I’ve done a quick recalc, which would mean that the emissions to 2030 from people born from now would be about 1.4 billion tonnes CO2, so about 13% of total UK emissions (rather than 30% as in the original post). No worries John. In case you didn’t spot it, the ONS statistics of “births per woman” are based on women of child-bearing age only. In rough terms that’s 16-ish to 40-odd, say about 30 years. But the average woman’s life expectancy is around 80 years. So there’s the factor of 2-and-a-bit for you. By the way, I’d like to thank you for this post. I was starting to feel quite guilty about my carbon footprint, but I now realise that by not having children I am probably responsible for far less carbon emissions in the long term than you are. I would write more but I’m off to check for cheap deals on flights to Barbados. TTFN! Doesn’t that just mean that we should both feel guilty? Two wrongs don’t make a right, and all that.